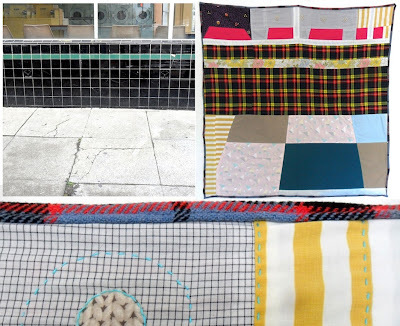 Last week I had the opportunity to exchange a few emails with Eliza Fernand about her up and coming workshop Collaborative Improvisational Quilting at PNCA which is part of their Quilting the Urban Landscape Series, June 29-30, 2013. Thank you Eliza for taking the time to share your personal experience, artistic vision and inspiration with us! Collaborative improvisational quilt stretched over a skylight. What is collaborative improvisational quilting and what can we expect to experience in your PNCA class? I think that improvisational quilting means working without a pattern, breaking rules and following intuition; and collaborative quilting is when a group of people are piecing their work all together. In the class I would like to emphasize recycling and working with reclaimed fabrics, modifying familiar patterns and entirely letting go of patterns, and working together to make a large-scale site-specific piece. As a group we will consider our quilting work as sculpture, as architecture, as a filter for light, and as something we are a part of but do not own. I hope it will appeal to experienced and first-time quilters, and will be slightly mind-blowing and invigorating to everyone involved. What makes this whole quilting thing important to you? To the world? In other words, why do you do it? That is kind of a huge question, and is probably either a total mystery or something that can be explained with a thousand answers... I often point out that I did not grow up with quilts so they have more of a mystical and iconic identity to me than to someone who owned quilts and used them in everyday life. I think from both perspectives, quilts are power objects- assemblages of fabrics, and thread, and hours of time and consideration, and repeated uses, and histories, and custom, and craft. From my perspective as an appreciative outsider, I have been interested to hear the stories of people and their quilts, whether they have one or twenty. The meditative quality of working with fabric, the spiritual connection to pattern and color, the power of making something imbued with your care; these are all possible answers to why we do it. I guess the question you are asking me is the question I have been asking with my artwork for the last three years- and I am still learning from experience. What inspired you to start making quilts into tents? Do you see this changing how we perceive what we typically think of when we think of quilts? I had been working in sculpture for ten years when I finally got the guts to make a quilt. In my sculptural and installation work, I often made a space to go inside of, so it was natural for me to think structurally. I am not trained to make quilts any certain way, so I can do whatever I want with it, and it seems my initial impulse was making monumental quilts. 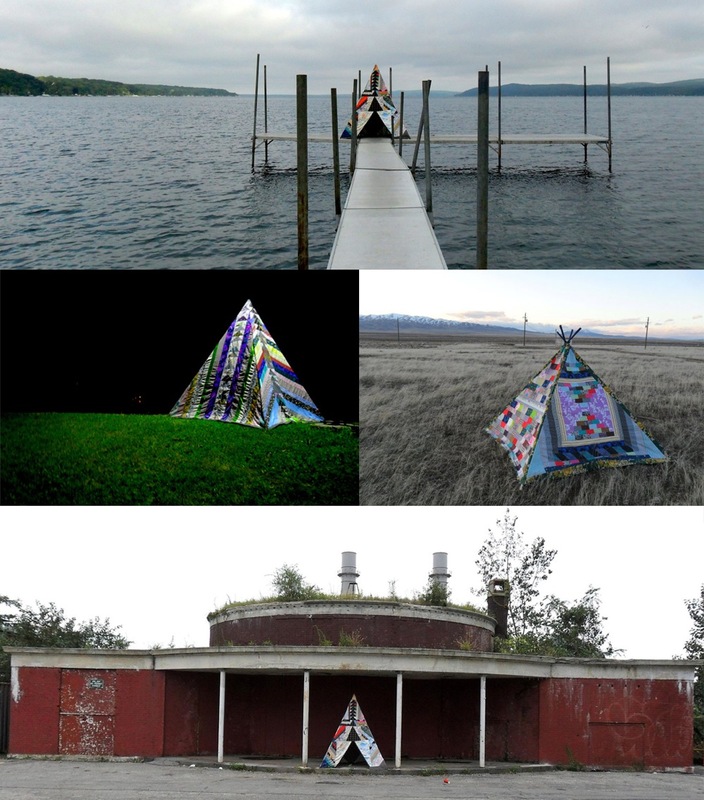 The tent is a space to tell stories; it has a transformative effect on our moods because the light coming in is filtered by a geometric patchwork of different colors; it references nomadic cultures, and a child’s blanket fort. A tent is also very utilitarian, but these tents do not work in the traditional way of protecting you from outdoor elements. I do want to challenge my viewer’s perception of quilting and quilting culture; I want to expand their idea of what a quilt can be, what it can mean. I am working with a tradition that comes with a very rich history, and am free to re-formulate this form. If the tents can push traditional perceptions of quilts, I still want to push it further, much further. You traveled all over the US with Quilt Stories. Tell us about one of your favorite quilting bee experiences during this tour. It is hard to pick favorites, because I was inspired every day while I was touring and talking with people and seeing the country. Two experiences really stand out for me though; the quilting slumber party I hosted in Minneapolis, and my visit to the regional quilt guild meeting in Northern Michigan. After hearing several stories about quilting retreats, I decided to host my own at the residency in Minneapolis I was at for two weeks towards the end of my summer tour. I made invitations, shopped for materials at the local Goodwill, and drew a ten-foot wide circle on the floor to fill with patchwork. People came and went throughout the night, stitching on the collaborative white quilt, piecing patchwork, and just hanging out. I think by 5am most people left and I got some sleep, then woke up to host a brunch where we hung the patchwork I put together from pieces by 14 contributors. We hung the patchwork over a large skylight and it was so amazing to see the light making a grayscale shadow of the quilt on the floor, and to see the handiwork of all these people coming together. 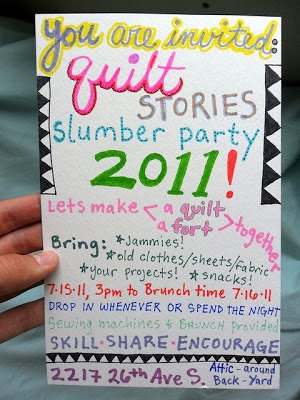 I repeated the slumber party again in Boise, and it is the basic idea for the workshop at PNCA. can bridge any differences in approach, concept, or technique. What's the tool or technique you couldn't live without? That is an easy question- needle and thread. You can do everything you need with a needle and thread. I guess scissors would be on that list, but if I didn’t have a pair I would use my teeth. Your work has been on display all over the country; where can we see it now? Next month? I have been exhibiting a lot nationally over the last few years, but I actually don’t have any shows coming up. I recently relocated to Oakland and have only had a studio here since March, so I am happy to spend time working on new ideas in the studio. The book I am making is a way to wrap-up the touring projects, so I am having some fun experimenting and thinking about my next step. I made a piece for a college campus that I taught at in April called Gift Pyramid that invited people to leave gifts for each other in pockets hung on the wall. With that piece, I wanted to make work that was interactive but I did not have to be present. I would like to make more work that can travel without me, and can facilitate exchange in communities. I also have plans for a solo show at a cafe in Oakland this fall. For that I am working on looking at quilts on a figurative scale, and playing with draping. I have been draping all of my older patchworks that I originally hung flat on the wall. You recently had a successful Kickstarter campaign to publish a book about Quilt Stories. Do you have a new quilting adventure planned? Making the book is the new adventure. I like working with a lot of different mediums and processes- I make animations, costumes, clothing, ceramics, quilts, sculptures, installations, songs, drawings, murals, performances, and videos; now I want to make a book. Each medium I approach I like to distill down to what I find to be the idea that the object is based on. For instance, when I started making functional ceramics, I made a signature mark to carve in the bottom of each piece- this is something I had seen potters do, but I was not trained as a potter, I was mimicking the craft. When I wanted to make music videos for the Quilt Stories Songs, I thought about how pop music videos have a lot of outfit changes, and nonsensical scenarios, and very very loose plot-lines, and worked with that idea. The book is in the style of an art catalog, and it is all about Quilt Stories, which is one project title that encompasses a whole slew of project tangents. So, my challenge is to document these projects in the book, appropriating the format of an art catalog, while making it something that interests and challenges me. You have a degree in sculpture but are a self-taught quilter. Do you have any personal quilting goals or techniques you would like to learn? Yes, I have many. I like teaching with experienced quilters because I learn new tricks from them as I am teaching. Making art is always a learning experience for me, and especially with sewing, as each project advances my skill set. I was thinking about making a traditional sampler quilt so that I could attempt all of the patterns I am interested in on a small scale. I have been getting really into hand-quilting and would like to make work where the quilting is as intricate as the piecing, or maybe more so. I am working on quilts in a different way than most quilters, because I see my work as contemporary art, but I do not see my work as part of the “art quilt” or “studio quilt” genres. Part of my work is investigating the use of quilts in society today as an amature antrhopologist, with interactive projects- and in that way I could be viewed as a Social Practice Artist. Also unlike modern quilters who often have a painterly style, when I am piecing I am mostly interested in geometric traditional patterns and their significance, so I see my work as concept-based and process-based. I also will only work with reclaimed fabrics- meaning repurposed from used bedding or clothing, or possibly yardage from a thrift store, but it has to be second-hand. I see most modern quilters using new fabrics- whether they buy prints or hand-dye their fabrics- they are purchasing new materials, usually produced specifically for quilting. I guess my approach to piecing is more old-fashioned in the style of scrap quilts and working with what you have. Re-activating these materials that are headed for a landfill is very important to me, and I find that these familiar fabrics have much more sentimental weight and sense of context than modern tapestry designs that look factory fresh. What's the one thing you absolutely must do/see when you come to Portland? My favorite Portland activity is walking over the bridges. I would like to take a walk where I cross at least three bridges. The river is the most massive force in that city; it is always flowing by quickly, but I find it very grounding. 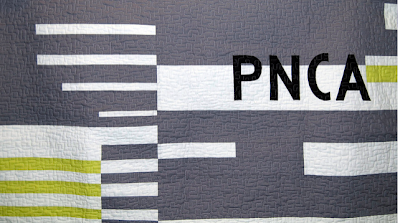 Don't miss Collaborative Improvisational Quilting with Eliza Fernand at PNCA, June 29-30, 2013. In this two-day workshop, students will explore patchwork quilts as architectural interventions. 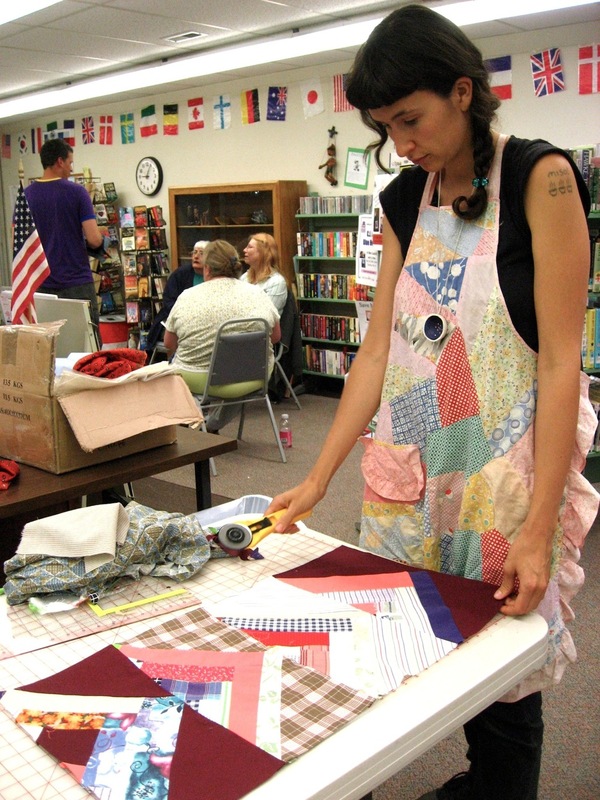 The class will learn about using improvisational techniques and materials, including deconstructed clothing and recycled fabric, to make individual patchworking adventures. We will examine how using different mediums including photography and sound to engage your audience. The class will create a collaborative piece and install it in a public venue.